Preheat oven to 400d F. Prep potatoes and place on a baking sheet lined with parchment paper in a single layer. Sprinkle italian herbs over potato wedges. Bake for 30 mins, flipping potatoes halfway through. Add sliced mushrooms when potatoes have about 10 minutes left to bake. Potatoes will be soft inside, with a crunchy, crisp outer skin when fully done. Enjoy over a bed of greens or with a side of spring rolls (see Lunch). Pre-heat oven to 400d F. Place potatoes on a baking sheet lined with parchement paper in a single layer. Sprinkle potatoes with Italian herbs. Bake potatoes for 30-40 minutes, flipping halfway through. 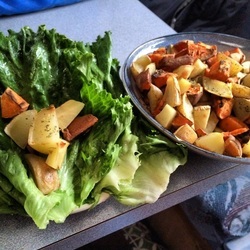 Place baked potato chunks in a bowl and place prepped lettuce leaf wraps on a serving place. 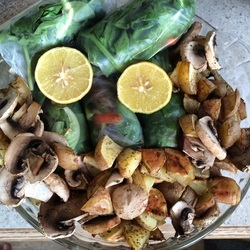 Fill lettuce wrap with desired amount of potato chunks and enjoy! Place 1 full nori sheet on rolling mat or cutting board. Scoop some rice onto the nori sheet, and starting from the bottom, create a thin layer of rice with a fork, leaving about 1-2 inches of bare nori at the top. Starting towards the lower center, place some sweet potato and spinach in a thin, lengthwise layer on top of the rice. 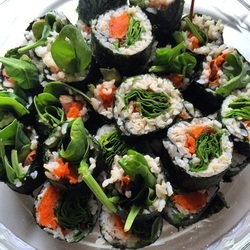 From the bottom, roll the nori towards the top, tucking the sweet potato and spinach into the roll as you go. As you get to the top, place a small amount of water on the bare nori to seal the roll. Once sealed, cut the roll into 1/2 thick pieces (one roll will make about 5-6 pieces). Repeat until all ingredients are used up! Serve with a side of lemon. Pre-heat oven to 375-400d F. Prepare a baking sheet lined with parchment paper. Combine all ingredients in a bowl and mash/mix together with hands, fork, or potato masher until well combined "dough" is created. Scoop out a handful of mixture and form into desired size burger patty and place on baking sheet. Repeat until all ingredients are used up. Make sure all patties have their own space on the baking sheet. Bake burgers for 20-30 minutes, flipping halfway through. 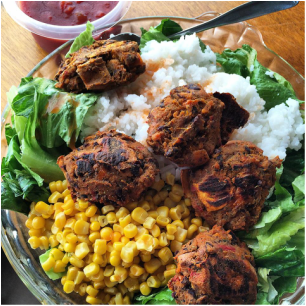 Serve burgers with a whole grain bun or over a bed or rice and greens. Diced tomatoes, jalapeno slices, salsa, or lemon make great condiments for the burgers! For single serving, stick to smaller ingredient listing. Fill bottom of cooking pot with about 1/2-1 cup water and saute onions and jalapeno pepper until translucent. Add diced tomatoes, beans, and spices. Stir ingredients until well mixed. Simmer on med-low for about 30 minutes, stirring occasionally. Serve chili with baked rolls, potato fries, or veggie crudites. Mash boiled potatoes together with a fork, whisking in butter and water as needed. Ideally we are going for fluffy mashed potatoes, so add small amounts of water until desired consistency is reached. In a small pot, whisk broth and flour together and heat for 5 minutes or until thickened on medium heat. Preheat oven to 400F. Using a non-stick baking dish (or line a pan with parchment paper), fill bottom evenly with Pie Base. Spread Mashed Potatoes evenly on top of the Pie Base. Bake Shepard's Pie covered for 15 minutes, and uncovered for another 15 minutes. I like to broil this dish for the last few minutes to turn the edges golden brown. Once finished, cut and serve Lentil Shepard's Pie with Gravy. This recipe makes about 2-3 servings. mushrooms, bell peppers, onions, spinach, cucumber, olives, pineapple, etc. Pre-heat oven to 425F. Line a pizza pan or baking sheet with parchment paper (if using small pans, you may need to make two pizzas). In a large mixing bowl, combine 1 cup flour and all dry ingredients. Mix thoroughly and slowly add water and rest of flour, mixing as you go. The end dough product will be moist, but not too sticky. Add a small amount of water if dough is too dry, or more flour if too sticky. Transfer dough to pizza pan/baking sheet and begin to press and mold dough into the pan using your hands and a roller. As the dough begins to form to the pan, use fingers to form a ridge for the crust. Once dough is set, place in oven for 10 mins without toppings. Prep sauce and toppings while waiting for crust to bake. For sauce, combine tomato paste, sugar, and lemon juice in a small container and stir until well mixed. Remove crust after 10 mins, add tomato sauce and veggie toppings, and bake for another 10-20 mins. Add raw veggie toppings if desired. Cut and serve! This recipe serves 1-2 people. Pre-heat oven to 425 degrees F. Line a baking sheet with parchment paper and set aside. In a food processor, pulse onion until chopped. Add kidney beans and pulse until chopped. Add remaining ingredients and process until well blended (burger mix will be thick but even). Spoon burger mixture onto baking sheet into 5-6 separate piles. Use the spoon to shape burgers into patties, smoothing out the top and sides. Once for the burger patties are formed, bake for 15 minutes, flip, and bake for another 10 mins or until golden brown. These burgers make a great replacement to traditional beef burgers, and go great with a whole grain bun, lettuce, tomato, onion, ketchup, mustard (or whatever you like) and baked fries for a tasty, healthy, low fat meal!